Miniatürk is a miniature park situated at the north-eastern shore of Golden Horn in Istanbul, Turkey. It was opened May 2, 2003. Miniatürk covers a total area of 60,000 m2. It is one of the world's largest miniature parks with its 15,000 m2 model area. The park contains 122 models done in 1/25th scale. 58 of the structures are from Istanbul, 52 are from Anatolia, and 12 are from the Ottoman territories that today lie outside of Turkey. Also featured are historic structures like the Temple of Artemis at Ephesus and the Mausoleum of Maussollos at Halicarnassus. Additional space is reserved for potential future models. ► 4 Hours Tours starts from your Hotel and finishes at your Hotel. ► Tour start time is up to your request. ► This is Private Tour with min. 2 person. ► Lunch is your own expence inside Miniaturk. • by Cash (EUR, TL, USD, GBP) during the Tour. 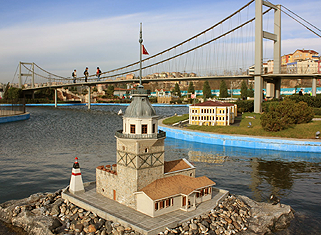 The construction of Miniaturk, the first miniature park in Istanbul, began in June 30, 2001. With great fanfare, Turkish Prime Minister Recep Tayyip Erdogan opened the park to visitors on May 2, 2003. Miniaturk covers a total area of 60,000 square meters. Its model area is 15,000 sqm, making Miniaturk the world's largest miniature park in respect to its model area. Miniaturk also boasts 40,000 sqm of open space, 3,500 sqm of covered area, 2,000 sqm of pools and waterways, and a parking lot with a capacity of 500 vehicles. The park contains 120 models done in 1/25th scale. 57 of the structures are from Istanbul, 51 are from Anatolia, and 12 are from the Ottoman territories that today lie outside of Turkey. Additional space was reserved for potential future models. The infrastructure was built taking into consideration the needs of potential additions. Therefore, Miniaturk will continue growing, modeling, in a sense, planned urbanization. The models were made in 13 workshops, 10 of which are located in Turkey. Apart from the workshops, the Circulating Capital Enterprises of Yıldız Teknik and Dokuz Eylul Universities also contributed to the production of models for Miniaturk. The models are made of industrial strength plastic-based material. This ensures that the models will be able to weather the elements. Before being placed on public display, all models must past a final test of the elements in the Miniaturk Test Area. The park hosts icons of many cultures and civilizations. Models vary from the Hagia Sophia to Selimiye, from Rumeli Fortress to Galata Tower, from Safranbolu Houses to the Sumela Monastry, from Qubbat As-Sakhrah to the ruins of Mount Nemrut. In addition, some works that have not survived into the present, such as the Temple of Artemis, the Halicarnassus Mausoleum and Ajyad Castle, were recreated. Special attention was paid to include every civilization that ruled in and around Anatolia and left their marks. Miniaturk traces a 3000-year history from Antiquity to Byzantium, from Seljuks to the Ottoman Empire and into the present day. The structures that are on exhibition in Miniaturk were selected by a board chaired by Prof. İlber Ortaylı and Assistant Prof. Ahmet Haluk Dursun. The board was careful to select architectural works whose models could technically be made. Monumental structures, which reflect the technology, art and culture of the civilization to which they belong and which witnessed fierce invasions, wars and destruction for thousands of years and yet still survived because civilizations protected and renovated them without destroying just because they were built by previous civilizations, are now represented by their models in Miniaturk. Aiming to create a fairy tale atmosphere, the Miniaturk project is divided into three main sections. The sections are Anatolia, Istanbul and the former Ottoman territories. The sections are separated from one another by small landscape designs that ensure continuity by guiding visitors throughout their visit. The landscape planning of the area took place simultaneously with the infrastructure work. The plants were raised in an environment with similar climate conditions to that of the Golden Horn. In line with the general concept of Miniaturk, the model area was decorated with fine grass, dwarf plants and bonsai trees. The grass and bonsai trees were planted after the models were put in their place. In addition to the models on exhibition in the open-air museum, Miniaturk also has different places where the visitors can enjoy themselves. These places include a 400-seat amphitheater, a gift shop that sells souvenirs of Miniaturk, a playground to attract the interest of younger visitors, a life size chess board and a labyrinth.